Microsoft is releasing a dashboard update to utilize USB drives for addition space. Two USB will be allowed at a time, with up to 16 GB of storage from each device. The additional space on the USB device will still be used for your PC or Mac use, and the the 16 GB can be used for Game Saves, Demos, and additional Marketplace content. "You can have 2 devices connected to the console at a time, enabling up to 32GB of simultaneous storage. The system won’t just configure the device once it is connected to the console. You’ll need to head to the memory area in system settings, select your USB Device, and choose from Configure Now (Format and Configure the Full Device), or Customize (you can choose how much memory you want configured for Xbox360 from the free space on the device.)" Besides being able to use any Device which will be formatted for use on the 360, Microsoft will be partnering with SanDisk to release some Xbox 360 USB devices. 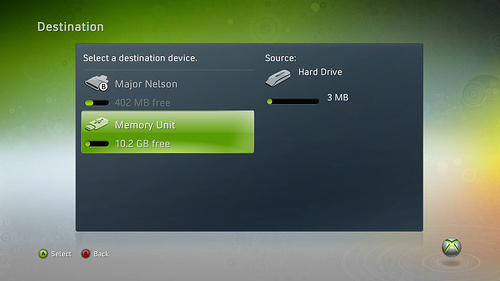 This is great news for those with a 20 GB Drive or anyone without a hard drive. Up to 32 GB will allow you to store some great content from the Marketplace!